Are you an outdoorsy person involved in activities such as mountain biking, scuba diving, water or snow skiing, cycling, hiking, exploring, fishing or simply camping? Would you like to record your unique experiences for your friends and family to see? Well, an action video recording camera may be what you should be considering. The best action camcorders are equipped with hard casings, are very solidly built, and can weather all kind of harsh conditions that your usual camcorder can not. It's as though their rugged exterior almost welcomes mud, snow and water, and they can even be used under water. Their smaller size, light weight, and simplicity of controls, make it possible to use them successfully in all kinds of awkward situations when your focus can not entirely be on the camera, but when first and foremost you need to pay attention to whatever "exciting" activity you're involved in. The best action video cameras record in HD (High Definition) and are equipped with an automatic focus feature so you don't have to pay attention to focusing the device while you're skiing down a mountain, or when you come face to face with a shark under water. These cameras can also take high resolution still photos. But one of the most useful features of these cameras is that they can be controlled remotely using either a wearable and immersible remote control device or your smartphone. Indeed, these cameras support Wi-Fi wireless, and they can be accessed remotely from your smartphone to control the camera or transfer recorded videos from it. This article will describe and compare action video cameras GoPro HERO3+ Black Edition and Sony Action Camera HDR-AS30V. These cameras are currently among the top action camcorders according to most independent reviewers, and they were the top two sellers in their category on Amazon at the time this review was written. Note that both Sony and GoPro have unveiled more recent models of their cameras, but given the rich features that the GoPro HERO3+ and Sony HDR-AS30V come with, we think there is no need to pay more for a few additional features you may not even need. Built-in Wi-Fi for wireless remote control. HDMI port for connecting to HD TV. USB port for charging and connecting to your computer. Immersible and wearable Remote Control device. iOS and Android apps for smartphones for remote control and transfer of recorded videos and photos for viewing. Availability of all sorts of mounts to be able to use the camera in all imaginable situations. Both cameras support the 1080p Full HD (1920 x 1080) and the 720p HD (1280 x 720) resolutions. In addition to these, the GoPro HERO3+ camera can also support resolutions such as 960p and 1440p while the Sony Action cam can support 480p. But here is the kicker which probably accounts for a good portion of the extra price you have to pay for the GoPro camera: The tiny GoPro HERO3+ Black Edition camera can also support 2.7Kp and 4Kp resolutions which are respectively almost two and four times the size of normal full HD at 1080p! But the question of whether these extremely high resolutions are practical needs to be addressed: Choosing the 2.7K resolution setting on the camera, you can record in 24fps or 30fps (fps = frames per second) which are the normal frames rates for TV and film. But when it comes to the 4K resolution setting, the camera can only record in low 15fps or 12fps frame rates, and the videos do not come out good; they are choppy and in general of unusable quality. Therefore, presently the 4K feature seems to be only practical for still photo shots. So, with the GoPro HERO3+ camera, 2.7K is the maximum practical resolution for capturing quality video, which is still twice the resolution you would get from the Sony HDR-AS30V. Note that both cameras can shoot 1080p Full HD at 60fps and at 30fps (fps = frames per second), and both cameras can also shoot 720p HD at 60fps and at 120fps which is ideal for making slow motion videos. In general the image quality is quite good for both cameras. The GoPro HERO+ cam is equipped with a lens that has been designed to operate optimally across various light conditions, and its auto low-light mode is supposed to adjust intelligently frame rate for low-light performance. So, whether you shoot in very bright or low-light situations, you should obtain at least in theory clear images, rich in detail. Similarly, the Sony HDR-AS30V cam is equipped with an Exmor R CMOS Sensor that is supposed to enhance the image quality when shooting in low-light conditions. But, a number of Amazon customers that have used the Sony HDR-AS30V have been somewhat happier with its low-light performance than those that have used the HERO+ camera. In addition, the Sony cam has a built-in image stabilization feature that differentiates it from the GoPro HERO3+. The feature works well by compensating for low level vibration and greater degrees of camera shake to deliver blur free smooth video, but it also comes with a certain degree of noticeable cost to the visible details during segments shot when things were really shaky. Note that both cameras can shoot with an ultra wide angle perspective. Neither of the two cameras have a built-in LCD screen to view your recordings on the fly. Their tiny built-in LCD screens are there only to display menu options. To playback your recorded videos, you will need to transfer them first to your smartphone using the available Android or iPhone apps. This of course may not always be very convenient, specially in the middle of some exciting action. The GoPro HERO3+ offers an alternate solution: you could obtain an optional LCD touch screen that attaches to the back of your camera (the camera has a 20 pin proprietary port for that). The optional LCD screen comes with an integrated speaker, volume control, and 3.5 mm headphone jack. Note that there is no headphone jack on the Sony Action Cam. Both cameras can be controlled remotely using a Wi-Fi remote control device which is immersible and wearable, or from a smartphone using the free apps that are available. Note however, that the remote control device for the Sony action cam , the Live View Remote, is not included in the purchase and has to be bought separately, while the remote control device for the HERO+ camera is included in the purchase. Built-in GPS: The embedded GPS feature found on the Sony HDR-AS30V can plot location and calculate telemetry. It can be used in conjunction with the free app to track your speed and performance (note that location, trail and speed information add more layers to your ability to analyze your performance). The GPS feature is not offered on the HERO+ camera. Overall, we can say that the two cameras are quite comparable, and your choice of camera should really depend on the additional features that each camera brings. If you think that the 4Kp, 2.7Kp and 1440p resolutions offered by the GoPro HERO+ is something that you need and that you will be using, or if you'd like to have an LCD screen that attaches to the camera for immediate playback, then you should go for the HERO+. On the other hand, if you want slightly better performance in low-light shooting, or you'd like to have a built-in GPS, then you should definitely go for the Sony. Note also the the Sony HDR-AS30V costs about $100 less than the HERO+. Please click the images below for exact price and additional product information or to purchase. Note that Amazon often gives a discount on the List Price. When you click the GoPro HERO3+ Black Edition below, you will also be shown the Silver Edition of the GoPro HERO3+ camera. Note that only the Black Edition comes with all the features discussed in this review. If you need additional information to decide, please refer to the comparison table below in the APPENDIX section for a side-by-side and point-by-point comparison of the two action cameras. 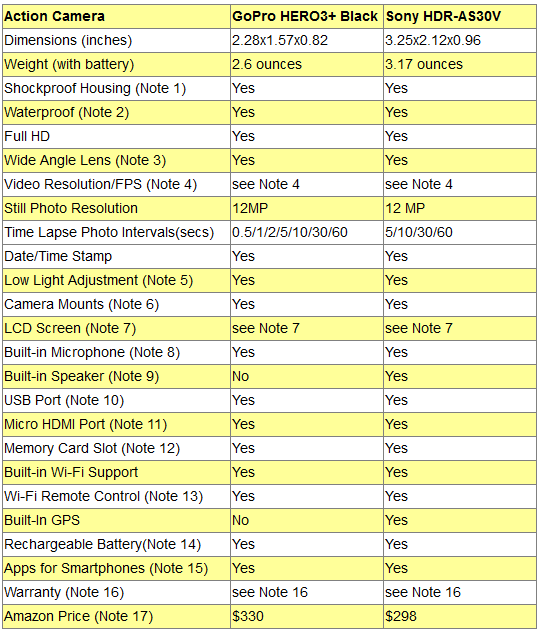 The following table provides a side by side comparison of the GoPro HERO3+ Black Edition and the Sony HDR-AS30V cameras. Following the table, please read the explanations to the notes referred to in the table to have a better understanding of the features offered by the two action cameras. Note 1: Both cameras come with a shockproof and dustproof housing included in the purchase. Note that the GoPro HERO3+ camera can also be housed alternately in a skeleton housing sold separately which features open sides that allow for easy plugging in of cables for live feed video out of the camera, or for charging the camera with a USB cable. Note 2: When used with the housing, the GoPro HERO3+ camera can be used in waters up to 197 meters (646 feet) deep while the Sony HDR-AS30V camera is waterproof down to 16 feet. Note 3: Both cameras claim to record at a very wide angle. The GoPro HERO3+ Black Edition viewing angles are either narrow (90°), medium (127°), or ultra wide (170°). The Sony Action Cam viewing angles are either medium (120°) or ultra wide (170°). Note 4: The GoPro HERO3+ Black Edition camera supports resolutions/fps of 1080p/60, 960p/100, 720p/60, 720p/120, 1440p/48 as well as 4Kp/15, 2.7Kp/30 and WVGA-240fps. The Sony Action cam supports resolutions/fps of 1080p/30, 1080p/60, 720p/30, 720p/60, 720p/120 and 480p/30 (p = pixel and fps = frames per second). Note that 720p/60 and 720p/120 are used to provide the 2x & 4x slow motion video modes in HD. Note 5: On the GoPro HERO3+ the Auto Low Light mode intelligently changes frame rates based on lighting conditions for enhanced low-light performance. The Sony Action Cam features a class-leading Exmor R CMOS Sensor, which results in good image quality, even when shooting in low-light conditions. Note 6: The Sony Action cam comes with one universal tripod mount. The HERO3+ comes with adhesive curved and flat mounts, and a 3-way pivot arm. Both cameras provide a whole variety of additional mounts as optional accessories making it very easy to attach the camcorder to your body, helmet, surfboard, bicycle, gear, vehicles, etc. for hands-free shooting in all sorts of situations. Please refer to Amazon secion below for the list of available Sony Action Cam and GoPro HERO3+ optional mounts. Note 7: Both cameras have tiny LCD screens that are there only to display and adjust menu options. They can not be used for playback of recorded videos. However, an optional LCD touch screen that attaches to the back of the GoPro HERO3+ camera can be obtained to view recorded videos and photos. The optional LCD screen comes with an integrated speaker, volume control, and 3.5 mm headphone jack. Alternately, since both cameras have built-in Wi-Fi support, they can sink with your smartphone, and you can view your recorded videos on your smartphone using the available free Android and iPhone apps. The Sony camera also supports NFC (Near Field Communication) to sink with the smartphones. Note 8: Both cameras have internal stereo microphones. But the ProGo HERO3+ can also be used with an external microphone via the mic jack integrated into the multi-use mini-USB port. The user needs to supply a mini-USB to 3.5mm converter cable to use the external microphone. Note 9: Though the GoPro HERO3+ does not have a built-in speaker, the optional LCD touch screen that attaches to the back of camera is equipped with an integrated speaker with volume control. Note 10: Both cameras come with a mini-USB port that is multipurpose and that can be used to recharge the battery, file transfer or firmware upgrades. On the GoPro HERO3+ cam, this mini-USB port can also be used as a 3.5 mm microphone input or an analog video output with the aid of optional adapter cables. Note 11: Used for video out. By connecting the micro-HDMI port on either camera to your HD TV, you can view your recorded videos in HD. Note 12: The HERO3+ Black Edition memory card slot can accommodate class 10 or higher microSD cards of up to 64GB. The Sony Action Cam memory card slot accepts Memory Stick Micro (M2) and microSD/SDHC (class 4 or higher) type memory cards. Note 13: The Wi-Fi Remotes for both cameras are waterproof and wearable. 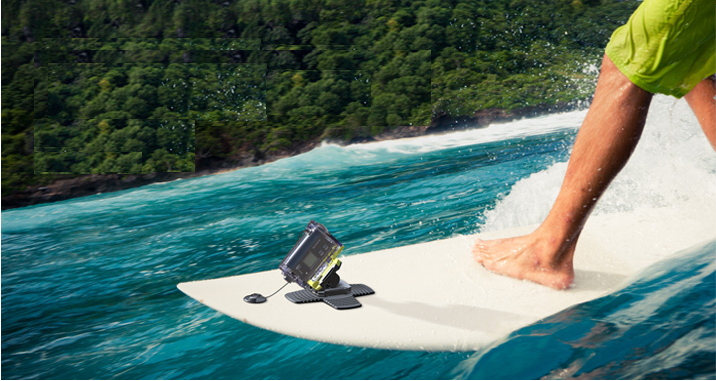 The Gopro Remote Control device can control up to 50 Wi-Fi-enabled GoPros at a time from a range of 600'. Note 14: Both cams use rechargeable lithium-ion batteries. The batteries are recharged via the USB port on the cameras. Note that for extended recording, the HERO3+ has also a 30 pin connector for latching on an external battery sold separately. Note 15: Free smartphone apps (iPhone and iPhone) are available for both cameras for remote control of the cameras and to transfer recorded videos form the camera to the smartphone for viewing. While the ProGo communicates with smartphones using Wi-Fi, the Sony Action Cam can be communicated with using both Wi-Fi and NFC (Near Field Communication). Note 16: The warranty on the GoPro Her3 is 1-Year for parts & labor, and the warranty on the Sony Action Cam is 1-Year for parts and 90-Days for labor. Note 17: Amazon prices usually include a good discount on the List Price. Note that prices may change at any time. For exact prices see the Amazon products section above. Compared Action Cameras on Amazon. Have you found yet the camera you were looking for?